Brisbane (pronooncit /ˈbɹɪz.bən/) is the caipital an maist populous ceety in Queensland , as weel as the thrid maist muckle ceety in Austraile, wi aboot 1,810,943 indwallers. It's locatit naur tae the Paceefic Ocean. Brisbane's aboot a thoosand kilometres (625 miles) Nor-East o Sydney. The ceety wis named in honour o Sir Thomas Brisbane wha wis Govrenor o New Sooth Wales frae 1821 tae 1825. The oreeginal toun grew frae a sair jyle toun shapit at his airtin in 1824 at a place cried Redcliffe, 28 km tae the north. The toun wis flitten tae wha it is the nou in 1825, an free indwallers (as contrair tae convicts) war alloued frae 1842. 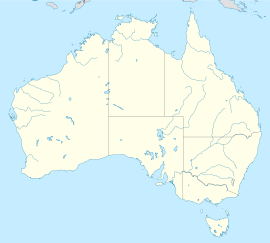 It wis chuist as the caipital whan Queensland wis proclaimit a sinder colony in 1859. The ceety slawly forderit till efter Warld Weir II, whan it wis gey important in the Allied campaign as the Sooth Wast Paceefic base o General Douglas MacArthur. ↑ "3218.0 – Regional Population Growth, Australia, 2015–16". Australian Bureau of Statistics. ERP at 30 June 2016. ↑ Australian Bureau of Statistics (30 April 2013). "3218.0 – Regional Population Growth, Australia, 2011–12". Retrieved 3 March 2014. ↑ Australian Bureau of Statistics (27 May 2013). "National Regional Profile: Greater Brisbane (Greater Capital City Statistical Area)". Retrieved 3 March 2014. Wikimedia Commons haes media relatit tae Brisbane. This page wis last eeditit on 11 Mairch 2018, at 20:19.